RAMADI, Iraq, Dec. 19, 2007 – Driving through downtown Ramadi today is a strange experience for anyone who saw the city in 2006. Navy Adm. Michael G. Mullen, chairman of the Joint Chiefs of Staff, visited the city today and said he’s amazed at the differences from a year ago. There is construction in the streets of the city; school is out of session and children play on playgrounds, including riding on a makeshift Ferris wheel that would give a safety inspector fits. The firehouse stands full of trucks, and firefighters sit outside waiting for a summons. Iraqi police patrol the streets. The market is fully stocked, and shoppers search for bargains in electronics, household appliances and food. Ramadi looks like a normal Middle Eastern city, albeit with a lot of buildings exhibiting bullet holes. Ramadi in 2006 and into 2007 was al Qaeda in Iraq’s capital city, with a population ruled by fear, intimidation and terror. Only 200 Iraqis were brave enough to serve as police in Ramadi. The provincial government could not sit in the city, the provincial capital, because of the intimidation. The governor and his staff were a government in exile meeting in Baghdad. Coalition servicemembers moving from one part of the city to another invariably received small-arms and mortar fire or struck improvised explosive devices. Many Marines and soldiers died in Ramadi. Charlton’s comments came during a walking tour of Ramadi’s market for Mullen, who walked through the market surrounded by children, their parents and just plain shoppers. Mullen also visited a joint security station in the heart of the city. 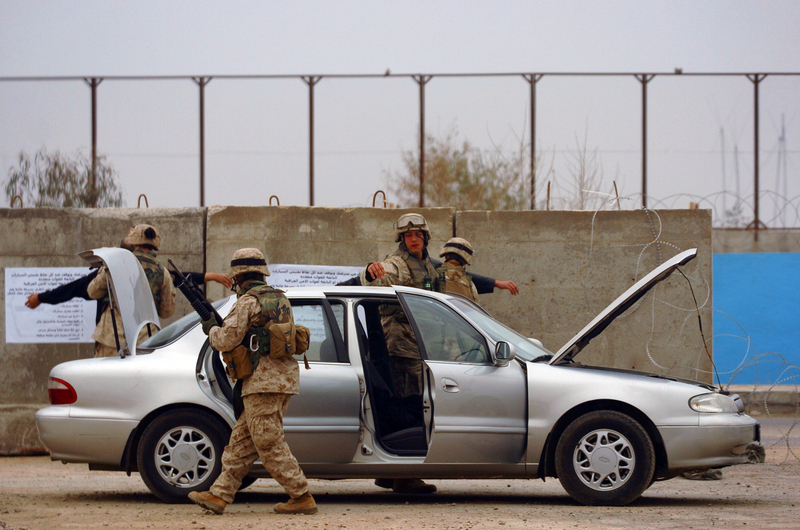 Manned by a company from 1st Battalion, 8th Marines, the station combines coalition forces with Iraqi security personnel and serves as a focal point for security operations in the market area.